High Intensity Interval Training (HIIT) – just another fad? HIIT is commonly used in training programs that promote fat loss as well as in sports performance training for team sports and track events. Most of our personal training clients utilize it to boost their metabolism for fat loss. HIIT training is usually signified by short intervals (<3 min) that are repeated 6-15 times. The rest periods between the intervals vary and range anywhere from 10s to 3-5 min. What does research say about HIIT training? Just six weeks of 3 HIIT training sessions per week seem to have a positive impact on VO2 and aerobic performance. Break length does not seem to be as important when it comes to the VO2peak improvement, resulting sprint performance or muscle Na+,K+-ATPase content. Really short breaks (10s) between 80 m sprint intervals seem to improve the performance over 200-300m distance more than breaks of a length of 60s. 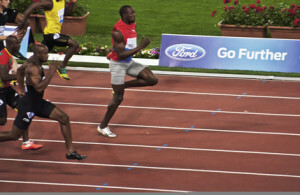 Both significantly improve the sprint performance over 100-300m. High intensity interval training seems to have considerable better effects in patients with a stable postinfarction heart failure than moderate continuous training. Not only did the researchers note positive cardiovascular but also peripheral adaptations in the muscle cell with higher mitochondrial activity. HIIT seems to stimulate mitochondrial biogenesis in human muscle. HIIT reduces insulin resistance in muscle cells. HIIT increases Human Growth Hormone in men and women. It makes you smarter, well not quite, but sprints seem to increase the release of BDNF (brain-derived neurotrophic factor), dopamine and epinephrine. BDNF is like miracle-grow for the brain and can lead to formation of new brain cells in the hippocampus. Increased dopamine and epinephrine levels help to form stronger mid-term and long-term memories. Steady state cardiovascular training seems to help with BDNF release after 5 weeks of training. Interval training seems to help with peripheral nerve damage repair whereas continuous exercise does not seem to have the same effect. Fat Loss & General Fitness: Now this gets interesting. The increased oxygen consumption after finishing a HIIT workout combined with the adaptations in muscles, and the reduced insulin resistance can help you shed those last extra pounds you were looking to get rid of. The increase in HGH helps with fat and sugar metabolism and improves muscle growth. Sports Performance: HIIT can give you the conditioning edge that you have been seeking in your sport. It improves your cardiovascular and anaerob abilities. Your Brain: It seems that cardiovascular activity, especially HIIT have a miracle-grow effect on your brain. You are actually capable of forming new brain cells, improve your retention rate when studying. Especially for students, or the older population threatened by Alzheimers and age related dementia these findings can have an enormous impact. Nerve Healing: If you have peripheral nerve damage, HIIT might just increase your healing rate. Now go out and do some intervals. Dupont, G., Akakpo, K., & Berth0in, S. (2004). The effect of in-season, high-intensity interval training in soccer players. The Journal of Strength & Conditioning Research, 18(3), 584-589. Felsing, N. E., Brasel, J. A., & Cooper, D. M. (1992). Effect of low and high intensity exercise on circulating growth hormone in men. The Journal of clinical endocrinology and metabolism, 75(1), 157-162. Griffin, É. W., Mullally, S., Foley, C., Warmington, S. A., O’Mara, S. M., & Kelly, Á. M. (2011). Aerobic exercise improves hippocampal function and increases BDNF in the serum of young adult males. Physiology & behavior,104(5), 934-941. Wideman, L., Weltman, J. Y., Hartman, M. L., Veldhuis, J. D., & Weltman, A. (2002). Growth hormone release during acute and chronic aerobic and resistance exercise. Sports Medicine, 32(15), 987-1004. Pincivero, D. M., Lephart, S. M., & Karunakara, R. G. (1997). Effects of rest interval on isokinetic strength and functional performance after short-term high intensity training. British journal of sports medicine, 31(3), 229-234. Sabatier, M. J., Redmon, N., Schwartz, G., & English, A. W. (2008). Treadmill training promotes axon regeneration in injured peripheral nerves. Experimental neurology, 211(2), 489-493. Saraslanidis, P., Petridou, A., Bogdanis, G. C., Galanis, N., Tsalis, G., Kellis, S., & Mougios, V. (2011). Muscle metabolism and performance improvement after two training programmes of sprint running differing in rest interval duration. Journal of sports sciences, 29(11), 1167-1174. Tremblay, A., Simoneau, J. A., & Bouchard, C. (1994). Impact of exercise intensity on body fatness and skeletal muscle metabolism. Metabolism, 43(7), 814-818. Winter, B., Breitenstein, C., Mooren, F. C., Voelker, K., Fobker, M., Lechtermann, A., … & Knecht, S. (2007). High impact running improves learning. Neurobiology of learning and memory, 87(4), 597-609.